EOC | What Does EOC Mean? 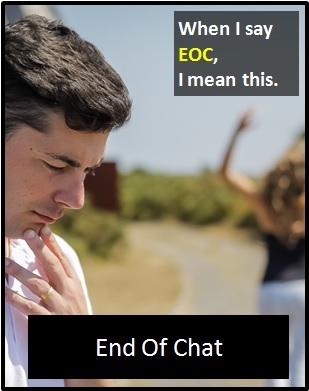 EOC means "End of Chat". The abbreviation EOC is used to indicate that a conversation is over. It is a short firm way of demonstrating that you are no longer willing to discuss a matter further. A more informal way would be to say something like "okay, I've got to go now" or "see you later". Of note, EOC can also mean "Extremely Out of Control", which is usually used to indicate that a person or a situation has become seriously out of hand. The term EOC means the conversation is over. Ali: Can you lend me some money? Steve: No. Nada. Definitely not. Never. EOC. Sally: I'm worried about Anita. She is drinking a lot at the moment. Andrea: That's not good. It sounds like she is EOC. As it is pronounced using its individual letters (i.e., "Ee Oww Cee"), EOC is classified as an initialism abbreviation. Initialisms are different to acronyms, which are spoken like words. EOC is also a standalone declarative sentence (i.e., a statement). Before the digital era, we would have said something like "I don't want to talk about it anymore" instead of EOC.